There is usually lots going on my flower garden in May and this year the borders are blooming lovely. Some of my favourite family friendly plants are appearing. Forget Me Nots, Aquilegia and Californian Poppies. 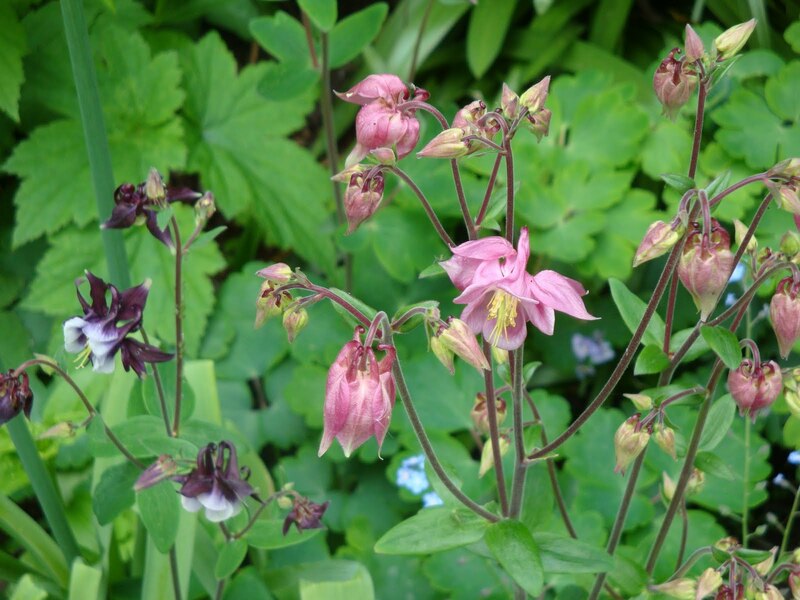 Their pretty flowers all appeal to children and they have easy names to remember – that is if you use the common name of Grannies Bonnets for the Aquilegia. For us adults they are great because they self seed like crazy, require very little maintenance and do not seem to be particularly tasty to slugs and snails. Not so family friendly can be their habit of self seeding into a lawn. Their seedlings are also great for potting up and giving to friends and neighbours. Today I realized that in fact I have forgotten. 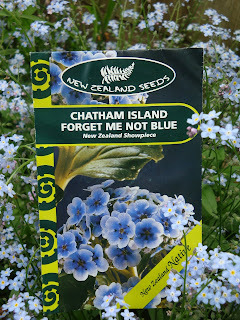 Last year I was given a packet of New Zealand Forget Me Not seeds which I had intended to sow in the autumn. This New Zealand native plant has intense blue flowers which group together in large clusters with huge glossy leaves. There are only four seeds in the packet so if I manage to grow them I think that they are going to be quite special. I also note that the New Zealand seed packet has an 8cm long measuring tape printed on it so you do not need to guess at measurements when planting your seeds. What a good idea. Hopefully your New Zealand forget-me-nots will self seed like my common ones do. I planted a California Poppy in my mother’s garden. I really need to mark it so I remember it’s there next year. And the good old columbine (aquilegia). I started with one white one. It has spread and some have come up purple and others came up yellow. It’s always a surprise to see what color they will be.